Reviewing zines and minicomics as frequently as I can. Even when they're terrible I kind of enjoy them for existing in a world completely unlike reality. The only people who exist are people who can fight, and they fight all the time! And they're so serious about it, as though who is the better fighter is the only thing that's important in the world. 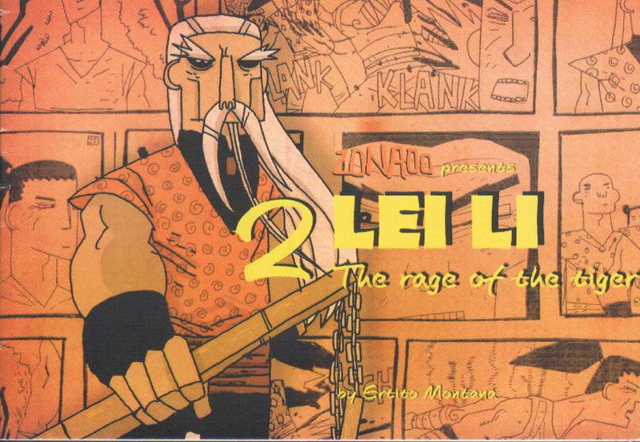 Anyway, I dug this comic by Montana that is apparently an adaptation of a screenplay by Ni Kuang (I couldn't figure out if it was based on an actual movie). It features people getting chopped in half, all out fighting action, people who feel the need to fight just upon meeting someone they've heard is good at fighting, and all the ridiculous miscommunications and misunderstandings that mean that they _have_ to fight. Plus the dialogue uses words like "pusillanimous". I liked the stylized perspectives and askew proportions of the characters that feature in Montana's art quite a bit. The hand drawn borders (none of which are completely straight), and the awesome sound effects really add to the style of art that's used. In fact, the only real problem I have with this comic is that it was printed so small! I wish the art was bigger so that I could appreciate it more. 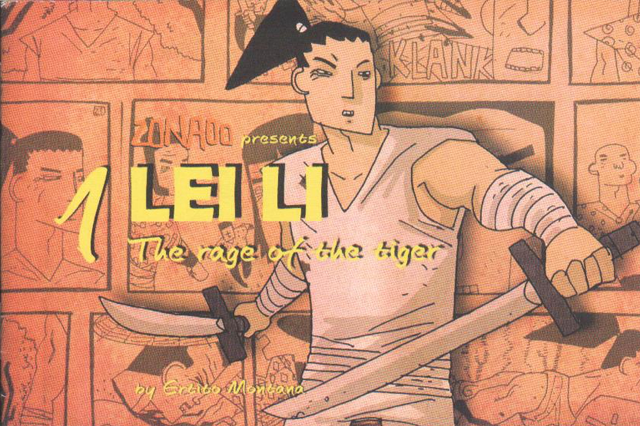 If you're a fan of Hong Kong action films and samurai comics you'll probably get a kick out of Lei Li: The Rage of the Tiger. I want to know what happens next! O_O another review about my work. Thanks. The comic is a complete adaption of the movie. My English is not very good and the dialogues are taken from the subtitles of the movie and I'm not sure that quality have. Hey Ertito! The dialogue does seem like subtitles, but I enjoyed that aspect! And I understand your problems with zine sizes. I loved it when I had access to a long arm stapler. 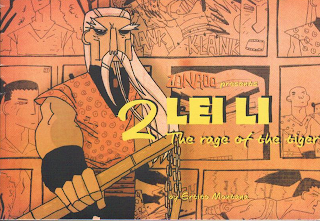 I try to review a zine or minicomic Monday, Wednesday, and Friday (ie. three times a week). Sometimes I post zine news, or other links as well. Want to trade with me? Check out my zines and see if I've done anything that would interest you. Want me to write something for you? Send me an email. My email is 365zinesayear@gmail.com. Hit me up. I only include website, email, and PO Box addresses. I'm not comfortable printing what could be people's home addresses on the internet. If you want your address included with the review of your zine let me know. July is International Zine Month! Two Fisted Librarians Issue !